The June VHF contest always holds much promise as we go into prime sporadic-E (Es) season. Activity is usually quite high, even with Fathers Day on Sunday. Last year, the atmospherics didn’t cooperate for most of the country, including in the Pacific Northwest. My final results were 497 QSOs and 35 grids. It was good enough for 1st place in the Western Washington section and the Pacific Division, and 3 place overall for the Limited Rover category. My best June score was in 2012, when we had spectacular Es openings, including double hops between the Pacific Northwest and the East Coast. My final results were 358 QSOs, 87 grids, and 19 states plus Canada and Mexico. So for this contest, the final score of 38,950 was good enough for 1st place in the Western Washington section and the Pacific Division, and 5 place overall for the Limited Rover category. So for this year, my objective was to beat my previous June score of 38,950. Preparations started long before the contest began. Until it became clear that the weather would not cooperate, I considered two routes. One route began by flying an airplane from airports in CN85 to CN76/CN77 to CN79. But the weather selected for me a fully terrestrial rove. I spent a bit of time trying to improve the route I ran in the January VHF contest. In the end, I only tweaked the route a bit. Specifically, I decided to hit CN98 on Mt. Pilchuck instead of nearby Green Mountain. (I did go to another Green mountain near Portland, however.) The road to Green Mountain was not cleared, according to the National Forest Service web site. The change did not affect timing. The only additional planning was to add a series of stops along the longer routes. That way, if there was an Es opening, I could head for the alternative location and milk the opening for all it was worth. I didn’t end up needing any of these locations. The station installation was pretty much what I had in January. I had a new Yaesu FT-857D. I damaged the front end of my old one during a Spring Sprint rendering it with reduced sensitivity on 2m and 432 MHz. Parts were on order, but they wouldn’t arrive until after the contest. So I bit the bullet and ordered a new one. I used the old FT-857D as a 6m FM rig in place of the Alinco I usually use. The single biggest station difference this year was a home-made antenna switching box. The box uses SMA latching relays to perform antenna switching. The switches are in a remote box that is near the operating position. Three of the antenna switches are SPDT, and simply allow me to switch a rig between the front and rear antennas. This is done for 6m, 2m, and 432 MHz. For 222 MHz, I have two rigs (a 222 MHz transverter + amplifier combination, as well as a 222 MHz FM rig), and I want to use both the front and rear antennas with each rig. Thus, the 222 MHz switch uses 4 SMA relays to create a low-loss, high isolation antenna cross-over switch. The antennas were pretty much what I’ve used in the past, but with one difference of putting the 6m yagi on top of the rear stack, instead of the middle. I rebuilt both the front and rear antenna masts. Antennas were cleaned, refurbished, and tuned in preparation for the contest. The front mast can be legally extended up to 14′ and rotated while in motion. In practice it is usually about 10′ above ground level to avoid low-hanging branches. The contest began early Saturday morning for me. I was on the road by 7:30 am PDT for the long drive from Redmond, WA to Ocean Shores, WA. The trip there was uneventful, although there was some kind of parade being set up in Ocean Shores for 11:00 am. Fortunately, I arrived before things got going. This location is at the Ocean Shores airport, in the car parking lot. The airport was surprisingly active, with a crew of locals putting up a new wind sock, and a Young Eagles event starting around noon. Friendly people stopped by to chat. As the clock struck 1800 UTC, I called CQ, and Paul, K7CW came right back to me. On 2m, I heard Caesar, N7BUS, calling CQ from Mt. Eleanor. Then I worked my friend John, KF7PCL, who lives in Ocean Shores (CN76!) on 6m and 2m. I had spoken to John many times during contests over the past few years and we had some email correspondence, but it wasn’t until he spotted me at the 2014 SeaPac convention that I actually met him. He told me he would be on for the contest. 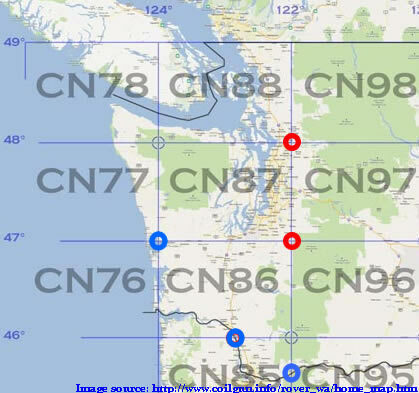 As it happened, there was another CN76 station on some ways to the South, W7Y. We worked on 6m and 2m but I wasn’t able to hear them on 432 MHz. At the appointed time, I headed about 1/2 mile south to the next stop in CN77. Among other folks, I worked W7Y on 6m and 2m again. I also worked KF7PCL on 6m, 2m, and 432 MHz, and remembered that I had forgotten to work him on 432 in CN76. So, on my way out of town, I swung by the airport again and worked him on 432 MHz. In departing Ocean Shores, I modified the usual route to Hoquiam (CN86) to traverse a bit of the southwest corner of CN87. That allowed me to work KF7PCL on 6m and 2m again. Then, of course, I worked John again (on 3 bands) in CN86, for a total of 11 QSOs with KF7PCL. There would be one more with him near the end of the contest. The drive through CN86 is a long slog through minimally productive terrain. I took a slightly longer route through Olympia that briefly brought me back into CN87 with a shot at Seattle. Only about 20 QSOs were made for the next 1.5 hours. Activity picked up as I headed up hill toward the CN86 stop near Green Mountain. The location provides excellent reach into Seattle and Portland. A few stations as far south as Salem, OR were worked, and W7Y in CN76 was worked again. From this location I made my first QSO with Steve, KE7IHG/R, who would shadow me on Sunday. This grid is located only about five miles away on the other side of Green Mountain, but about 10 miles by road. The location has even better reach into Portland and Seattle. One big surprise was working KA6BIM in CN73 on both 2m and 6m. As things wound down in CN85, I headed for N. Bonneville, WA, on the Columbia River Gorge to just inside the CN95 grid. I arrived a few minutes after 10pm PDT. The location is surrounded by rock to the north and south, but gets into the Portland area quite well. The big surprise here was working W7EW in CN84 on both 6m and 2m. And then there was KA6BIM in CN73 on 6m! I packed it in around 11pm PDT and headed for a motel room in Centralia, WA, about 2 hours away. No more QSOs were made en route. The day passed without so much as a hint of Es. Sunday began at 5:45am, with a quick shower and a departure time of 6:15. I had about two hours of travel to hit the next stop in Carbonado, WA, at 3,200′ in CN96. This is one of the choicest roving locations in the Pacific Northwest. Of course, there were QSOs to be made along the way. While en route, I made a couple of QSOs in CN86, 24 QSOs in CN87 and ten more QSOs traversing a few miles of (elevated) CN86. At some point in CN87, I drove right by Tom, KE7SW’s house, and joked about stopping for some hot coffee (I was drinking day old stuff out of a second thermos), but duty called and I pushed on. The view and the reach from the 3,200′ CN96 spot is phenomenal. QSOs from Sequim, WA to Portland, OR and places in between ensued. I was happy to work W7EW in CN84 on 6m, and KB7W in CN93—that’s Bend, OR on the other side of the Cascade Mountains. I worked my buddy Doug, AC7T, who lives down the street from me in CN87. We worked on 6m and then, again, on 2m. He was using the 6m and 2m antennas I usually use out of my airplane, and only 2.5 watts on 2m. We were both pleased. After 2 hours, I managed about 80 QSOs. But there were no Es QSOs at all. Occasionally I heard a brief opening to California, but the opening vaporized before I had a chance to join the fun. A few minutes behind schedule, I moved down the road to CN86 (again!). This 3,000′ location and has, in the past, provided many QSOs even after spending most of Saturday in the grid. I worked about a dozen stations, including Doug, AC7T, again on 6m and 2m. About this time, Steve, KE7IHG/R drove by me on his way to the CN96 spot I had recently vacated. Great! After some set-up time we worked on all four bands giving me four new multipliers. The whole time at this spot, Es propagation teased me with occasional bursts of southern California coming through, but then fading away. Finally, at about 10:45 am PDT I started working a few out-of-region grids. Another 40 minutes yielded three QSOs to DM45 and one to DM33 (and more local QSOs). After some 30 QSOs in CN86, I circled 1/4 mile back to CN96 and worked KE7IGH/R on four bands, giving him four new multipliers, and then headed down the hill to CN87. I arrived at this stop, at 2,050′ on the same road, about 45 minutes behind schedule. There was no sign of Es, but I filled in some QSOs with local folks, and worked KE7IGH/R on four bands. I tried to save time by shortening my stay a few minutes. While en route to CN97, I did work K6RMJ in DM13. I arrived and was set up only about 20 minutes behind schedule in CN97. I worked local stations for about 20 minutes. Then an opening to California produced QSOs to CM86, CM88, CM95 and CM98, followed by three QSOs to DM06, all over a 25 minute period. After the burst of CA, I worked KE7IHG/R in CN97 in nearby Buckley. I left the grid at the scheduled 2:05pm departure time with a total of about 50 QSO. My spot in CN88 was about 2 hours away. Along the way, I discovered that KE7IGH/R was right behind me on Interstate 5. We were both headed to Lake Stevens High School. I told him I would go to the nearby elementary school, instead. The location is slightly higher, slightly closer, and, I guessed, it would have less RF noise than the noisy High School. The disadvantage is that it had poorer exposure to the south, where most local stations are located. As I neared the CN88 grid line, I worked my pal Dave, KA7RRA/R, who was sitting up at 3,150′ on Mt. Pilchuck. We worked on 6m and 2m, but he didn’t have a 432 MHz antenna. He did, however, have a handheld dual band FM rig, so we worked on 446 MHz. We did it again after I passed into CN88. As I suspected, the elementary school was relatively RF quiet, but some stations to the south were harder for me to work than KE7IHG/R. I worked no stations south of CN87. And no sign of Es. I left the grid early, after about 35 QSOs, to head to Mt. Pilchuck. KA7RRA/R and I established that we would be 3/4 mile apart at my planned destination. This particular Mt. Pilchuck location was just shy of 3,000′. I began the 2013 ARRL UHF contest from another nearby location, but this spot was new to me. It was quite a spot. I arrived about 35 minutes early and had already worked 14 stations in motion, and would work over 50 more before the end of the contest. Here were some of the highlights. John, KF7PCL, worked me again from CN76. I worked W7EW in CN84 on 6m and 2m, and toward the end of the contest, we attempted and completed a QSO on 432 Mhz, over a 225 mile path. After many attempts, I worked VE7DAY in CO70. KE7IGH/R worked me on 223.5 MHz from CN98, adding a new multiplier for both of us. I worked K7NG in CN72 on 6m for another multiplier. And a QSO with VA7FC provided my only 6m QSO to CN79. I worked a total of 5 new multipliers at my last stop! Alas…no Es. Even so, the end of the contest was a lot of fun. The contest results are summarized in the table below. The preliminary score is 681 pts × (50 multipliers + 10 grids activated) = 40,860. This slightly beats my 2012 score. But instead of 358 QSOs and 87 grids + 9 activated, I ended up with 540 QSOs, 50 grids + 10 activated. The difference is largely a huge decrease in grids owning to few sustained Es openings this year, but a large increase in QSOs. This is the first time my (preliminary) score has exceeded 40,000 in an ARRL VHF contest. And K7CW (50 MHz only) worked me in 9 of 10 grids. The lack of sustained Es propagation was a bit disappointing but, overall, the contest was quite enjoyable. Small station improvements (e.g. the antenna switching box) contributed to a better score, but the biggest improvements were operating conveniences or procedures that greatly bumped up the raw QSO count. And it was helped by the presence of two other rovers (KE7IHG/R and KA7RRA/R) in the region.